We’re celebrating the new redesign of DYOB with 7 days of giveaways from 10 incredible bloggers! Read the full story and details of the redesign here. Thinking about redesigning your blog but not sure where to start? How about with a new theme or template? Today we have not one, but THREE talented theme designers giving away one theme or template to one lucky winner each! The Dancing Panda for winning a theme from Cristina Web Design! Anna for winning a theme from Restored 316 Designs! Marie for winning a theme from Angie Makes! So happy for all of you!! Check your emails. We still have 3 more giveaways this week including today’s so don’t worry if you haven’t won yet! I am so excited to be featuring themes from some of my favorite theme designers: Angie Baldelomar of Angie Makes, Cristina Jensen of Cristina Web Design and Lauren Gaige of Restored 316 Designs! Angie and her partner Chris founded Angie Makes in 2010 with a desire to create custom, beautiful, and feminine web designs for our clients. Their custom designs eventually led to the development of highly customizable girly WordPress Themes, clip art creations, watercolorings, and fonts. Their small and diversely talented team consists of Angie who serves as lead designer and Chris, the ultimate WordPress guru, who handles ongoing theme development and support. You won’t regret using an Angie Makes theme! Check out their shop of gorgeous WordPress themes. Cristina is a web designer on a mission to make the Web a better looking place. She loves browsing and coming across great websites. Not just great looking websites, but websites that tell a story and are easy to navigate. Wouldn’t it be nice if that included your site or blog? 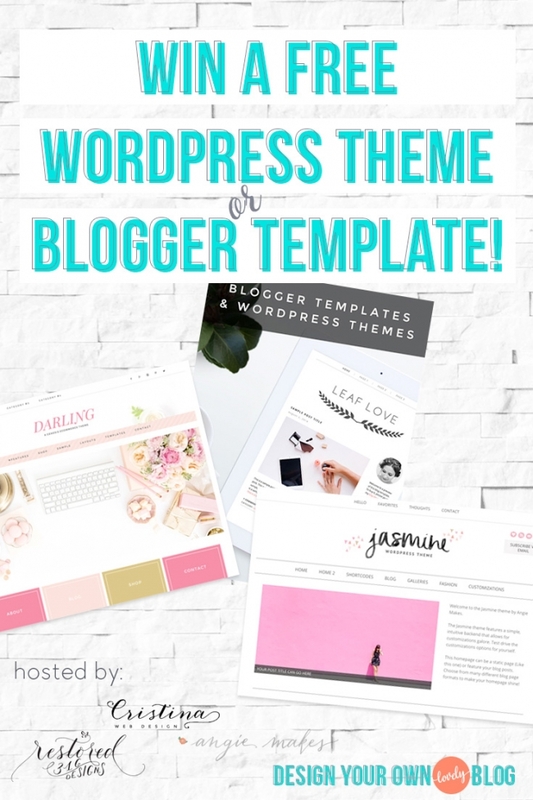 Cristina does custom blog and web design, but she also offers affordable pre-made blog templates in case you need to give your blog a quick facelift. The templates are for both Blogger and self-hosted WordPress. They’re all mobile responsive, which means they look great on any screen size. And if you need any help, Cristina is just an email away! See her shop of beautifully minimal Blogger templates and WordPress themes. Lauren and I share a very similar passion: a passion to help other women start a successful business and/or blog! She does this by giving them a luxury design, amazing support, and affordable website design without the headache! She’s a mama who gets to work from home while providing an income for her family and that’s all she wants for other moms too. She lives and breathes design every moment of every day and it’s what drives her to help others! Since starting Restored 316 over 7 years ago Lauren has worked with thousands of clients from all over the world to bring their big dreams to life! Check out her shop of incredibly popular WordPress themes! Entries made starting now through 6am (MST) tomorrow (8/14) are valid. Three winners will be selected at random on Friday and announced right here on this page! We could really use help with our website design! We’ve used free WP templates so far, but none of them have accurately captured our girly, creative spirit. We firmly believe that a better-looking site will bring us more views and help us become more successful. Thanks! WOW!!! such a generous offer. It was really difficult to chose one theme only from each designer that I liked. To win a website theme as pretty as any of these, means I am soooooo much closer to my goal of getting my website up and running and my business started. I am almost done with coaching school, and for me, this will be my LAST career transition. I will be 50 in 6 months. my goal is to be up and running so that I can give myself the greatest gift ever: freedom from the corporate life. Lol you’re too cute! Great reason, good luck! Oh and one more thing…. sigh…. I’ve been having tons of trouble finding a good, free WordPress theme, and it has hindered me from beginning a WordPress website. Winning one of these beautiful themes would really encourage me to begin a website that I’ve been dreaming about for ages. I’d love to win a new theme. I’m launching a new blog (coming Sept 2015) and I’d love one of the gorgeous handcrafted themes from Cristina Web Design, Restored 316 Designs, or Angie Makes! I’m launching a new blog (coming September 2015) and I’d love a beautiful handcrafted blogger template or WordPress theme from Restored 316 Designs, Angie Makes, or Cristina Web Design. i love Bright Bunting by Cristina Web Design, Lovely by Restore 16, and Meadowbrook by Angie Makes. It would be incredible to win a new blog template! I have been trying to get a website up and running for the past couple of years, but it just hasn’t happened. I haven’t found anything that I love yet. The price of a stunning theme has not yet been in my budget, so this would be amazing for my business! Every theme is so lovely! I’d love one of the awesome themes from Cristina Web Design, Restored 316 Designs, or Angie Makes! I’d love to win a new design. I have one already from 316, but I’d really like to start a new blog with a new design and name and any of these would be perfect..
I’d love to own Delightful from Restored 316. Thank you Marianne for the opportunity. I’ve been a fan of Lauren for a while and absolutely lover her themes! Winning one would be fantastic and would mean a lot! the designs are all so beautiful it was hard to choose just one. Thanks for letting me join the giveaway, Marianne! IT TOTALLY DID CRISTINA!! I’m sooooo sorry 🙁 I’ll see what i can do about contacting those who have entered so far to follow your actual account. I have been eyeing up Restored 316 for a while now… it’s girly without being over the top and just the flavor I have been looking for. I would LOVE to win! And I can’t choose. I have it down to like 5..lol… but keep going back to tasteful. I love the Restored316Designs themes, and I install them regularly for other people. I literally had the Divine theme in my cart and then saw this giveaway! Guess I’ll wait another day before buying- fingers crossed! My site is definitely in need of a facelift- thanks for the opportunity! I would love to win one of these beautiful themes. I have spent literally months trying to decide on the right theme and it is totally paralysing my ability to write. I really want to get the design side sorted and get on with creating awesome content for my readers. Thanks for the opportunity. I would SO love to win one of there gorgeous themes! I’m planning to get back into blogging in the coming months, as a place for my soul to share and rest, and would treasure one of these lovely designs. It would be a massive deal for me to win a WordPress template, because I am having some issues with my current one not being great for customizing. I literally spent hours looking over wordpress themes for my site and winning one would make it a little easier to get my site up and running. I currently have an Angie Makes theme that has served me SO well for the past 1.5 years, but would love a chance to update my look to better reflect where I am in my blogging journey now! SUCH a fun giveaway! Thank you!!! I’ve just launched my first ebook, and I want to upgrade my WordPress theme to something a little more streamlined again to help make my branding more cohesive. I would love to have a template from any of these talented women. I’m launching my blog site soon and have been wrestling over if I should change my current template, but I’m just not in love with any of the free WP themes. I would absolutely love to win a template to help me start my blog off beautifully! I would love to win a Restored 316 design. I currently have Adorn and love it. What I truly love though? Their support. Hands down the best in the business. Doesn’t hurt with er that the themes are beautiful and easy to work with too! Winning a new theme would ease the redesign I know is needed for my blog. I’m not very artistic and so design goes over my head. Tweaking a template myself is a lot of extra work that would be eliminated by winning a new theme. I would love to win a new template because i have been searching for tips and tricks on how to come up with a great blog and i will actually be getting my soul into this all the way after my finals in nov so i really hope to revamp my blog with a beautiful new template & thus really hope to win today’s giveaway! It’s been a goal of mine to FINALLY make my blog more of a part-time career and less of a hobby. My husband and I are working towards building a new home and I’ve always seen my DIY blog as a way to share that with my readers – a new blog design would be the perfect touch to showcase the building process! Hi Marianne!!! I’m loving the new look! Everything looks so clean and professional! Toyin recently posted…What’s in my Carry On Bag? WordPress MailChimp plugin. Blog design inspiration. WordPress Genesis for Beginner’s Course 2.0. Free stock photography downloads.